All About Scuba Diving & Snorkeling World Wide with Carl Roessler! 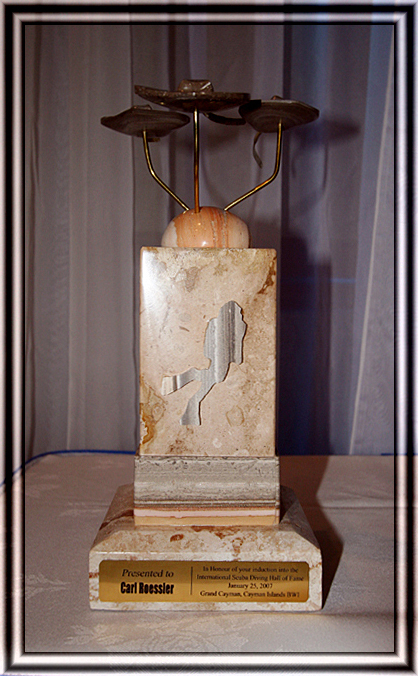 Click on the trophey. . .
On January 25, 2007, Carl was accorded the honor of induction into the International Scuba Diving Hall of Fame at a lavish event in the Cayman Islands. 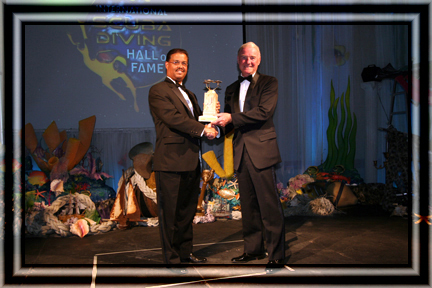 The banquet, induction ceremony and film festival were hosted by the government and diving industry of the Cayman Islands, one of the earliest countries to become a major destination for divers seeking tropical underwater adventures. Carl joined such giants of diving’s Golden Age as Jacques Cousteau and his son Jean-Michel, Hans and Lotte Hass, Sylvia Earle, Ron and Valerie Taylor, Stan Waterman and Paul Tzimoulis. The International Scuba Diving Hall of Fame honors those early pioneers who designed the equipment and the training for the first generation of international divers, those who first explored the wonders to be found in the world’s remote diving venues and those who published the stories which inspired them. Carl’s 2007 class brought the membership in the Hall to forty-three. 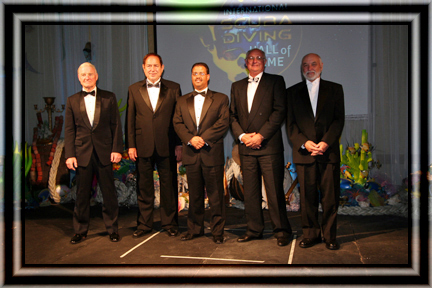 The 2007 inductees included the famed Australian researcher and author of over 60 books Neville Coleman; Paul Humann, captain of the 70’s-era Cayman Diver live-aboard and author of several identification books on marine life; Ralph Erickson, a deceased co-founder of the vast training empire PADI and Rodney Fox, Carl’s long-time friend and originator of diving with great white sharks who went from 1963 shark victim to champion of the great predators. It was a moment and an honor to be cherished, as it caps one’s entire career. Despite the joyful celebration, it was also a serious moment to remember those great leaders—many now gone--who made today’s diving world possible.